The MC2 is a pro grade high performance ankle cold and compression brace designed by a leading NBA certified athletic trainer. On or off the court the patented MC2 is a premium ankle pain management and recovery solution. The removable polyurethane U-shaped torex® gel inserts provide focused therapy. The heavy duty elastic 3 point fastening-system allows for ultra-fast self-adjusting compression that maximizes treatment. Insulating Sleeves. 4 pack for $4.95 Click here to order! Provides fast first aid for acute soft tissue injuries and other conditions requiring cold or heat applications to combat swelling, pain and bruising. Ensure Torex Pro Ankle is not too tight as excessive compression can restrict circulation. Two fingers should easily slide between pack and treated area. Place Insulating compression sleeve and/or sock over area of treatment. Place left and right u gel inserts into boot on interior Velcro® surface with largest part of gel insert pointing towards front of foot. 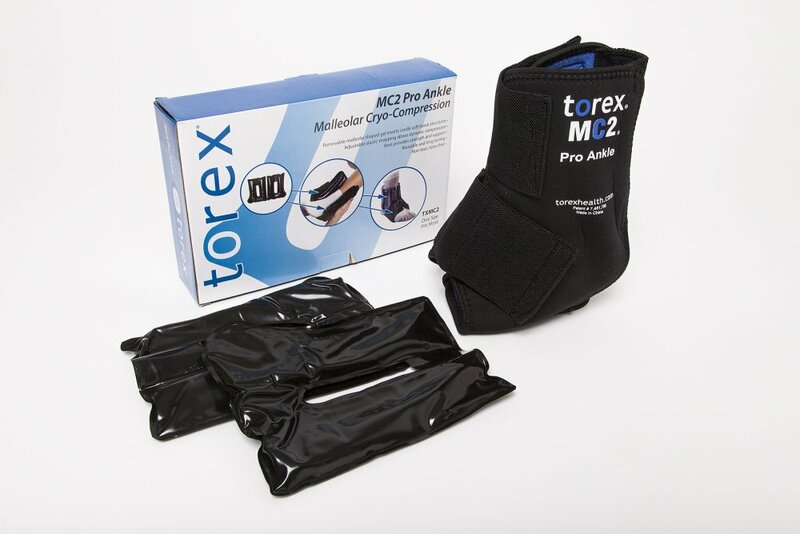 Locate MC2 on desired foot, gently close the compression straps to the desired level of compression. If frozen, remove MC2 after 10 minutes or if it becomes uncomfortable. Wait 20 minutes prior to second application if required. For maximum life and performance we recommend that torex® u gel inserts be stored in the freezer after package has been opened. To store and protect gel inserts out of the freezer always place in a heavy duty zip type freezer bag, squeeze out air and seal closed. Return to freezer as soon as possible. Normal product life is about one year. Fabric boot can be hand washed in warm water and air dried as needed. Package includes: one malleolar compression boot, one pair torex® u gel inserts, one stretchable non-latex regular ICS 47 insulating compression sleeve and application instructions.